Kevin Daniel Hand Signed and Numbered Limited Edition Giclee: "Winters Crossing "
Edition: Artist Handsigned and Numbered Limited Edition to 150 / 50. About the Artist: When Kevin Daniel explored an interest in painting as a young man, he had no thought that his interest would develop into an award winning career and passion as an artist. Studying the works of classic artists like Rembrandt, Renoir and Monet, he became amazed by their attention to detail, panoramic scenery and use of colors. Kevin's initial concentration in wildlife art depicted realism and nature's beauty with the subjects in his portraits. 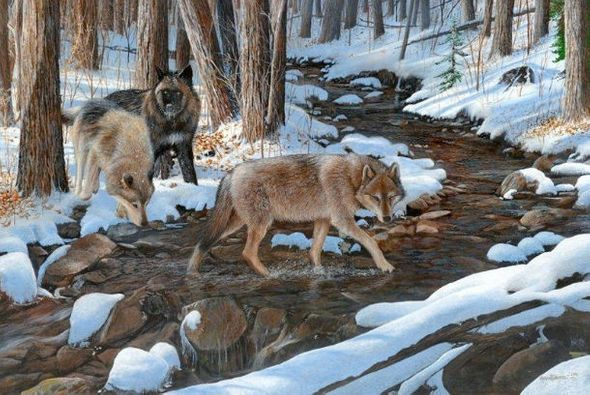 Kevin says: " with my love and passion for nature, I wanted to focus on the realism of wildlife art, bringing to life the subtleties of the outdoors from a natural but unique position." Due to popular demand and confidence in his artistic talents, Kevin concentrated his work on waterfowl, earning him national awards as well as becoming a two-time Minnesota Duck Stamp winner. Kevin continues to be challenged by the variety and complexities of wildlife he finds fascinating to capture with the paintbrush as well as the camera. Kevin's upbringing in the Minnesota outdoors continues to inspire him. According to Kevin: "growing up in Minnesota, not only did I want to capture the wildlife and nature in my paintings but I also wanted to share and reflect on memories with family and friends. I have memories of fishing, camping, and even music lessons and each have an influence on how I paint."